This page outlines some of the common experimental approaches we use to study our questions, with a few examples of what the data can look like. Primary cultured neurons from the dynein-GFP mouse showing cytoplasmic dynein (cyan) and the immunolabelled axonal marker Tau (orange). Primary cultured neurons immunolabelled with MAP2 (magenta) and the excitatory post-synaptic marker PSD-95 (cyan). Primary cultured neurons from the dynein-GFP mouse showing cytoplasmic dynein (cyan) and the immunolabelled pre-synaptic maker synapsin (orange). Observing the transport process as it happens in cultured neurons is central to our experimental approach. Primary culture gives us the experimental control and access we need to conduct our experiments. In particular, we do a great deal of work in primary hippocampal cultures; the hippocampal pyramidal neuron is a key model cell for neuronal biology because it develops in a highly reproducible way in culture over several weeks. However, different populations of neurons are differentially vulnerable in disease states, and in the context of understanding the molecular mechanisms of disease we also carry out experiments in other neuronal populations e.g. 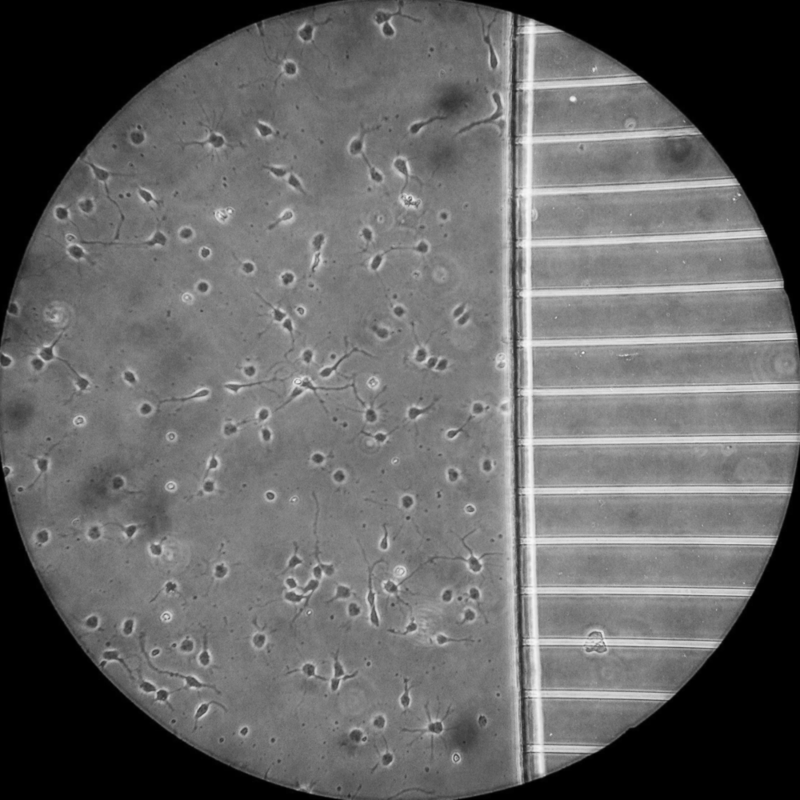 ventral horn cultures when studying motor neuron disease (ALS) or striatal cultures when studying Huntington's Disease. Microtubule mediated transport is all about moving things from A to B. That means we need to image the dynamic processes we study with time-lapse microscopy. 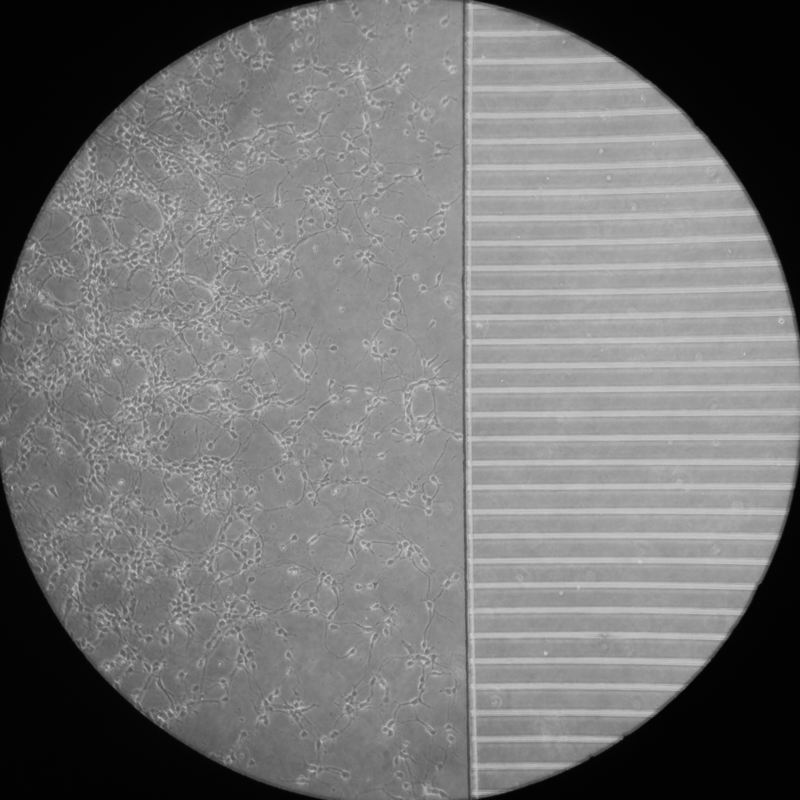 The type of behaviour captured by these methods (and the data we can extract) is very dependent on the frame rate used to image, so we make a conscious effort to image motility over several orders of magnitude; from sub second changes through to cellular behaviours over many hours. Imaging is only the beginning though. We track and measure the objects we're looking at very carefully, in order to understand how our experimental manipulations change their movements. Bi-directional EB3-GFP comets moving through the dendrites of a cultured neuron, captured over a few minutes. Neurite outgrowth captured over several hours. Tracked vesicles moving in an isolated axon. Schematic diagram of a microfluidic chamber. Neurons are plated into the somal side. The microgrooves are too narrow for neuronal cell bodies to enter and so as the culture grows, only axons cross the grooves to reach the distal axonal side. A phase contrast image of primary hippocampal neurons a few days after plating in a microfluidic chamber. A phase contrast image of primary hippocampal neurons a few days after plating in a microfluidic chamber at a higher magnification. A phase contrast image of the axons of primary hippocampal neurons having crossed the microfluidic grooves a few days after plating. Microfluidic chambers are small culture devices made of polydimethylsiloxane (PDMS). These chambers allow the morphological and fluidic isolation of the axons of neurons, bringing an extra layer of control to our experimental set up. For example, the chambers allow the specific labelling of distal axons with markers of retrograde transport, which can then be tracked as they move back to the cell body by live cell imaging within the microgrooves. To compliment our cellular studies, we also build transport systems from the bottom up to test our hypotheses of motor protein regulation. These in vitro reconstitution systems use purified recombinant proteins labelled with fluorophores. By polymerising microtubules and anchoring them to a glass surface we are able to see single motor protein molecules walking along microtubules by Total Internal Reflection Microscopy (TIRF). Individual kinesin motors (cyan) walking along immobilised microtubules (magenta) imaged by single molecule TIRF microscopy. Schematic diagram of the experimental set up for TIRF imaging of microtubule motors in vitro. Spot detection and frame to frame tracking of the motility of single kinesin molecules moving along a microtubule.